March madness is here, but the best game was played in February! I was in El Paso, recently, but I missed a classic basketball game that was played there by a couple of weeks. The special game was on Tuesday, Feb 12, and it was fantastic! It was an example of great coaching, team play, and sportsmanship to the max. Coach Peter Morales put Mitchell Marcus into the game with only 90 seconds left to play. It was a strategic decision he had made before the game was played. 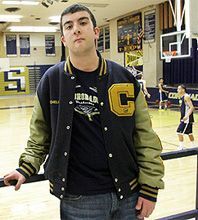 His Coronado High Thunderbirds were playing rival Franklin High that night, but Mitchell had not started the game. He would not have the pressure of leading the team to victory. And it wouldn't be fair to call him a "secret weapon." In fact, it would be Mitchell's first game ever to suit up and go onto the floor as a player. Mitchell had wanted to play before. In fact, basketball has been his passion since infancy. He loves the game and enjoys being around it. He has a developmental disability, however, and just can't compete at the level of making his high school team. Coach Morales had made him Team Manager. Everyone on the team loves Mitchell and enjoys having him around. On that last game of the season, Coach Morales gave Mitchell a uniform and asked him if he would like to suit up for the game. He could sit on the bench and be one of the guys. He would wear a team jersey and be part of a special night. How special it would be, though, Mitchell had no idea! Before the game started, Coach Morales decided that he would put Mitchell into the lineup at some point. Whether winning or losing, game on the line or already decided — the coach was going to let Mitchell make a special memory. With a minute and a half left to play, Coronado High was leading by 10. The coach put Mitchell in the game. The crowd went wild with chants of "Mitchell! Mitchell!" His teammates got him the ball. He shot — and missed. He shot and missed again. Then, with only seconds left on the clock, they passed the ball to Mitchell once more — and he mishandled it out of bounds. So Franklin High senior, Jonathan Montanez, was given the ball to put it in play for a final time. Here's what Jonathan did: He yelled for Mitchell, tossed the ball to him, and let him take one more shot. He hit it! Mitchell scored the most memorable two points in recent basketball lore. "I was raised to treat others how you want to be treated," said Jonathan. "I just thought Mitchell deserved his chance." Mitchell has his memory now — and the rest of us have a lesson in kindness, an example of sportsmanship, and a case study in living by the Golden Rule. The coach put Mitchell in the game. Maybe It Isn't Dead Yet! "What a Basketball Game!" by Rubel Shelly is licensed under a Creative Commons License. Heartlight encourages you to share this material with others in church bulletins, personal emails, and other non-commercial uses. Please see our Usage Guidelines for more information.